I recently picked up a 1903 copy of The Complete Chess Guide by F. J. Lee and G. H. D. Gossip. 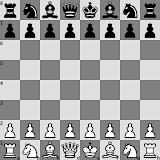 It contained the following game between J. Gunsberg and M. Tschigorin in Havana, Cuba. There was no date given, but I estimate it was the late 1800s.